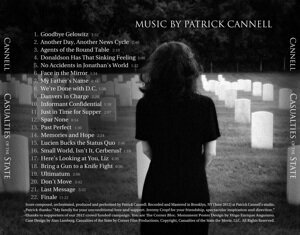 Score composed, orchestrated, produced and performed by Patrick Cannell. Recorded and Mastered in Brooklyn, NY (June 2012) at Patrick Cannell's studio. "My family for your unconditional love and support. Jeremy Cropf for your friendship, spectacular inspiration and direction." Thanks to supporters of our 2012 crowd funded campaign. You are The Corner Bloc. Monument Poster Design by Hugo Enrique Anguiano. Case Design by Alan Lamberg. 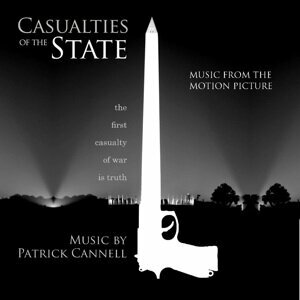 Casualties of the State by Corner Film Productions. Copyright, Casualties of the State, the Movie, LLC. All Rights Reserved.